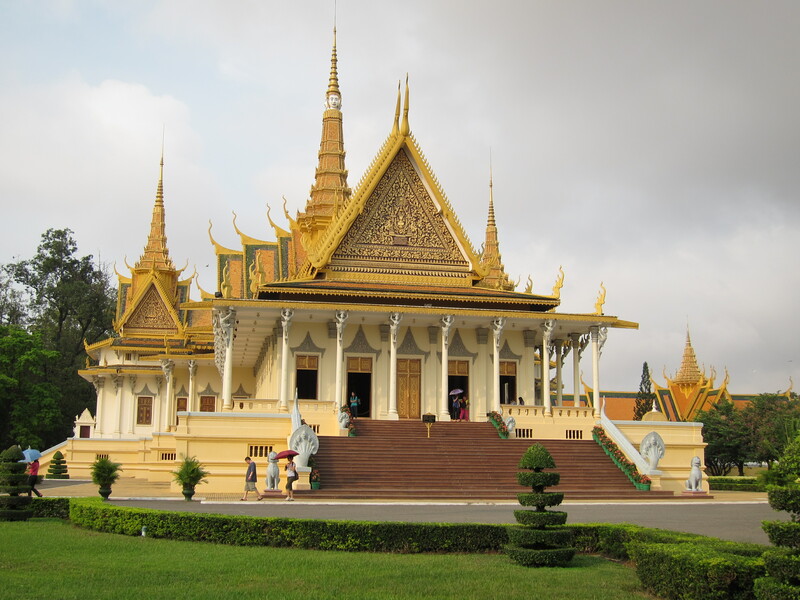 Cambodia’s royal family still lives in the royal palace in Phnom Penh so you don’t have access to the whole thing. The parts you can visit, however, are beautiful. In its intricacy and ornateness, the palace felt like a Cambodian version of Versailles, the wedding cake of homes. Such a lovely way to look at it, Hannah! It was modeled after the temples in Bangkok and I can see it! Can’t you? Yeah, I noticed the similarity. I’m not sure the Cambodians copied the Thai. It might have been the other way around. That’s what happened with dance; the Thai invaded at some point and brought the Cambodian ballet back to Thailand. Fish Sauce, Motorbikes and the Golden Tortoise by Hannah Cowles Baldwin is licensed under a Creative Commons Attribution-NoDerivs 3.0 Unported License. Based on a work at hannahinhanoi.wordpress.com. Permissions beyond the scope of this license may be available at https://hannahinhanoi.wordpress.com/.